Todays General Session at VMworld 2014 was mainly about EUC and one of the new items was VMware Workspace Suite. VMware Workspace Suite combines application, device and data management with centralized identity management and policy enforcement to empower anytime, anywhere workers, transform workflows and simplify IT management. 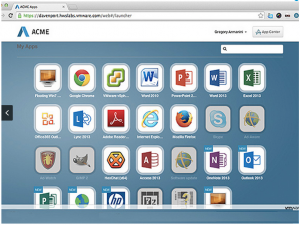 VMware Workspace Suite enables simple, seamless anywhere productivity. How? 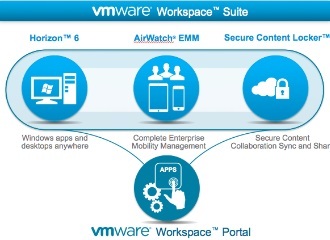 By offering secure, single sign-on access to Windows, web and SaaS applications are just one touch away on mobile devices as subscribed applications from the VMware Workspace Portal enterprise AppStore appear in the AirWatch App Catalog. 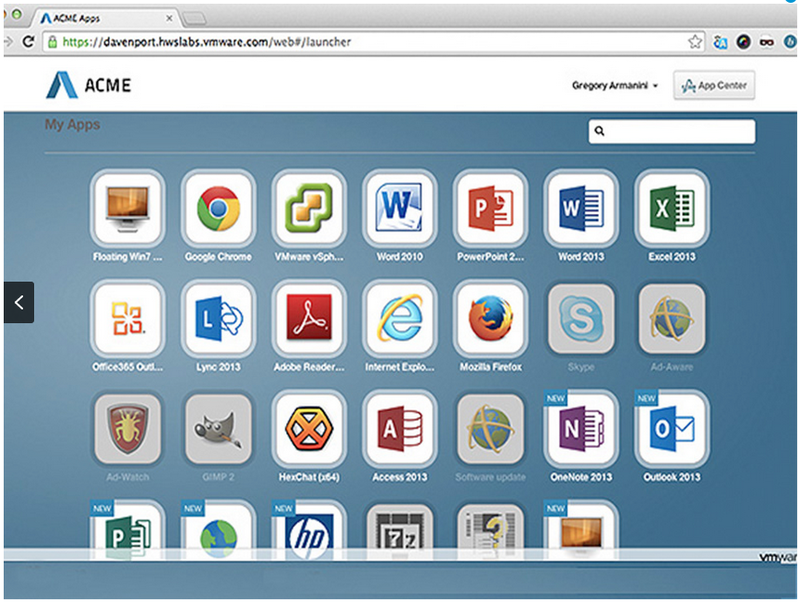 AirWatch Secure Content Locker with unique content publishing and collaboration features makes it simple to access the files you need from any device. 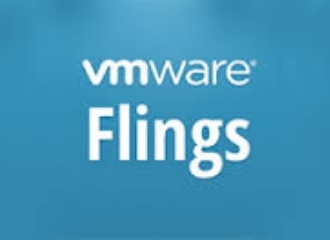 The AirWatch self-service console is securely published with a single touch in the VMware Workspace Portal so files may be accessed from anywhere. 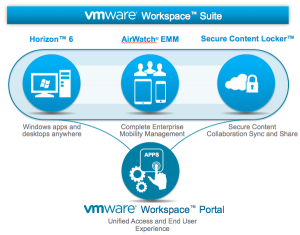 VMware Workspace Portal, AirWatch mobile device management and Horizon form an application delivery platform that can handle nearly any application today and in the future. Administrators can design policies that keep access simple with common sense enforcement based on the sensitivity of the application in combination with device, user, application and location policies. Meet the highest service level agreements while proactively monitoring usage patterns and performance metrics with our unified platform which monitors and automates resource management across private and public clouds with vCloud Automation Center and vCenter Operations Manager. VMware Horizon 6 Enterprise Edition. 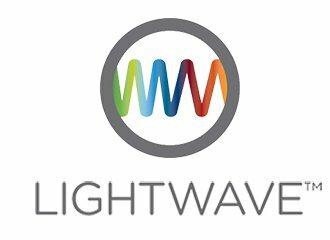 Desktops and Applications Delivered Through a Single Platform. Deliver virtual or remote desktops and applications through a single platform to streamline management, easily entitle end users and quickly deliver the Windows resources users need. Central Image Management of Virtual, Physical and BYO Images. Centrally manage virtual, physical and BYO images to simplify operations, reduce costs and maintain compliance. Consolidate control, automate delivery and protect user computing resources. Optimized for the Software-Defined Data Center. VMware Horizon 6 extends the power of virtualization with virtual compute, virtual storage, and virtual networking. 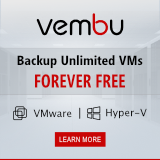 Enterprise-grade Security Policies and Data Loss Prevention. Authenticate users using AD/LDAP, Kerberos, token and certificate-based methods. Content is encrypted in-transit, in use and at-rest with AES 256-bit, FIPS 140-2 compliant encryption. Configure restrictions for advanced data loss prevention, including offline viewing, cut/copy/paste, printing and emailing along with ‘open in’ restrictions. Flexible Content Storage in the Cloud or Existing Repositories. Get flexible content storage options for cloud, on premise and hybrid deployments. Content Sharing, Editing, Feedback and Peer Collaboration. Allow users to share files and folders with internal and external stakeholders through the self-service portal. Promote collaboration with editing, annotation and commenting capabilities on shared files. Utilize the Outlook plugin to minimize clicks for end users and for email attachment security. Content Dashboard and Analytics with Complete Audit Trails. View content inventory at the organization, file or device level with real-time content dashboards. View and manage all mobile devices from the central admin console. Enroll devices quickly, configure and update device settings over-the-air and secure mobile devices. Manage internal, public and purchased apps across employee-owned, corporate-owned and shared devices from one central console. AirWatch supports Bring Your Own Device (BYOD) programs, with unprecedented device choice and support for the device ownership models you choose without compromising the security and management of your mobile fleet. Define and enforce secure browsing policies from the admin console and customize settings as needed. Meet enterprise security and management requirements for shared devices while providing the personalized experiences users demand. Separate corporate and personal data on devices, securing corporate resources and maintaining employee privacy. Standardize enterprise security and data loss prevention strategies across mobile devices through our flexible approach to containerization. Offer self-service access to thousands of apps including web/SAML, remote Windows apps, packaged Windows app delivery and hosted desktops that integrate directly with the AirWatch catalog on mobile devices. Provision and de-provision users and entitlements by workspace users and groups or AD groups with full Active Directory integration. Cross-Device, Any Device, User Experience. Deliver a consumer-like experience for the enterprise with customizable HTML5 portal that supports any desktop or device. Dynamic Access Policies and Single Sign-On (SSO). Enforce security and access policies on AirWatch enrolled mobile devices and users with single user identity across all apps and services. Understand license consumption and produce compliance audit information with user engagement and app usage reporting.